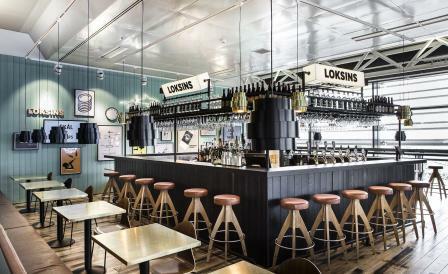 The era of glamorous travel may be long gone, but a successful attempt to reignite its erstwhile charm can be found at Loksins, a bar located in Iceland’s Keflavík International Airport. Conceived by Reykjavik-based HAF Studio, the space evokes an ambience similar to that of a local downtown bar, with designers Karitas Sveinsdóttir and Hafsteinn Júlíusson specifically looking to Icelandic timber houses for inspiration. This cheerfully manifests itself via weathered Nordic pine on wall claddings, as well as the floors, which have been suspended from the ground. Committed to making the connection between the space and its locale more than skin deep, all furniture has been either produced or designed in Iceland, from the brass tabletops to the black stone countertops. Elsewhere, stools and chairs crafted from oak and teak, and upholstered in cognac-coloured leather, sit underneath bespoke pendant lights. It all amounts to a vibrant atmosphere far removed from your average sterile airport pit stop. And lest travellers forget where they’re coming from — or, indeed going to — the bar is punctuated with frequent references to Icelandic tradition and culture. Graphics and animations advertising the local craft beer, Borg, were designed in collaboration with the New York-based studio Karlsson Wilker, while the menu is interspersed with Icelandic delicacies such as dried fish, Brennivín and the country’s infamous fermented shark.